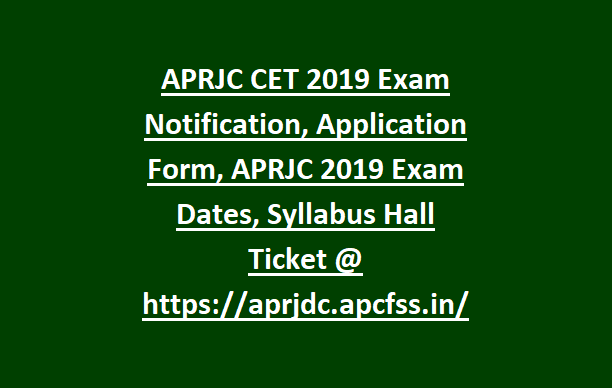 appearing candidates are eligible to apply for APRJC CET 2019. Candidates have to pay Rs.400 as fee application and apply online from 14-03-2019 to 14-04-2019 for this APRJC CET 2019. The joint entrance examination will be held on 09-05-2019. 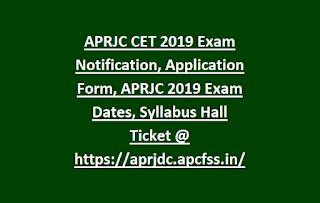 Official website to apply online for this APRJC CET 2019 is https://aprjdc.apcfss.in/. Exam Pattern and Syllabus, online application process, Counseling Dates, Hall Ticket date, eligibility criteria and other details are updated below for this APRJC 2019 Exam Notification. The entrance examination APRJC 2019 is conducting for filling the available seats in 7 Intermediate Courses offering Residential Jr. Colleges (English medium) and 13 Mahatma Jyotiba Phule Residential Jr. Colleges in the State. Starting date of application process : 14.03.2019. Last date for online application: 14.04.2019. Fees Payment Process: 14.03.2019 - 14.04.2019. Students who are appearing for 10th class exams in March 2019 they are only eligible to apply online for this APRJC CET 2019. Exam Syllabus for APRJC CET is 10th standard level and for English Syllabus will be General English. OMR based test will be conducted for this APRJC CET. Written Exam duration is 150 Minutes. APRJC 2019 Exam will be conducted for 150 Marks. APRJC CET 2019 Exam will be conducted for admission in to the 6 Intermediate groups. Application fee is Rs.250 for APRJC 2019. Hall Tickets for APRJC CET 2019 will be available from 01-05-2019 at https://aprjdc.apcfss.in. APRJC CET counseling starts after 01-06-2019. Students who are appearing for the 10th class exams they are only eligible to apply online for this APRJC CET 2019.